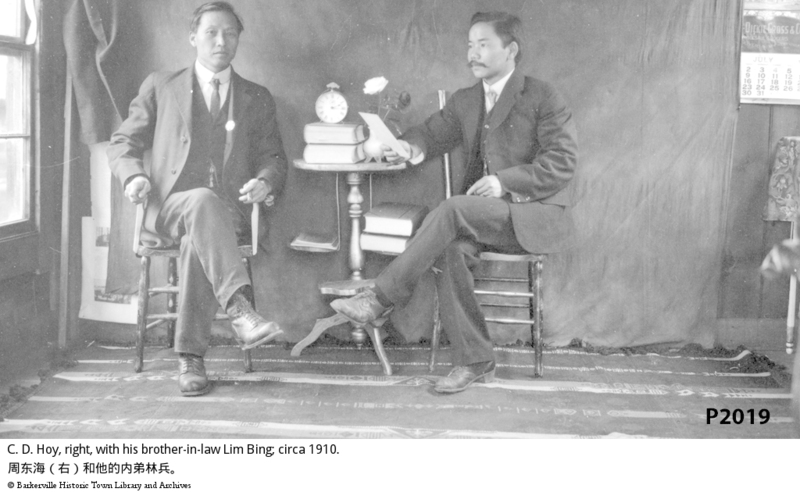 ItemBARK_1990.0003.0795 - C. D. Hoy, right, with his brother-in-law Lim Bing; circa 1910. Item BARK_1990.0003.0795 - C. D. Hoy, right, with his brother-in-law Lim Bing; circa 1910. C. D. Hoy and another Chinese man seated on wooden chairs (one of which has been modified) in front of a dark cloth backdrop. Between them is a small circular table with four books, a clock and flowers. On the floor is a rug of Native design. To the left is a window. See also P 2020, P 2039, P 1692.